New Giant IPad Launching Soon: Is Technology That Good For Our Kids? Apple is set to launch its new ‘giant’ IPad this Wednesday alongside other gadgets. Tech savvy and gadget addicts cannot wait for their new toys. This reminded me of a book I came across about 3 years ago warning against the threat of Television becoming the new teacher. Can technology truly become the new teacher? Is it really that good? He argued that it’s okay as long as the kids are supervised when they are using the device. In this way the device is not really teaching them bad things as you are always there to monitor and explain. True. But how does it work in practice? 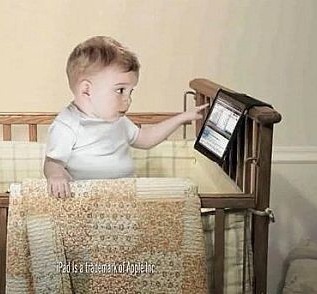 Do you always stay with your child when he is using an IPad or watching TV? Commercials pop up all the time. How will you monitor what they are watching? On the Internet, what will your child do when pop ups will try to redirect him towards something inappropriate? What will you do regarding issues associated with the Internet like cyber bullying, gaming and other addictive behaviours? Will you watch everything your child sees before he does it so that you know it’s appropriate for his age? I mean how does it work in reality? I recently received an email claiming that “behavioural neuroscientists in the United Kingdom, United States and Australia released findings of increased addictive electronic device behaviour and reductions in academic concentration, attention, memory retention and learning outcomes”. The study found that along with early patterns of inappropriate behaviours (0 – 3 age range) children’s brains are being bombarded and scrambled by the use of many electronic devices making students unable to concentrate for any long period of time, listen and respond to instructions and complete activities. Experts recommend that phones not be given to children before 13 years of age and even then, it should only be a ‘dumb’ phone, not a ‘smart’ phone. I know, I know. That’s just one side of the story. However, wouldn’t there even be an iota of truth in there? And if there is, would I want to take a risk? Or one might ask: how much risk am I willing to take? I fully believe in IT and its numerous advantages and I also believe it is my duty as a parent to assist my child with positive developmental experiences. So, if I can restrict the electronic devices in the early years and monitor closely later, I believe that would be a great start to those. I believe I can be a better teacher to my child than TV, tablets or other electronic devices can be. What do you think?